Treatment: Formalin baths for 30 to 60 minutes, or as long as the fish can take it are used for the treatment of parasitic turbellaria. The formalin baths should be repeated every three days until there are no signs of infection. Some hobbyists have also had success with the use of freshwater dips. Identification: The most obvious sign of black Ich are numerous dark spots covering the body of the infected fish. 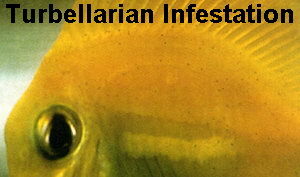 Prevention: Treat infected fish as soon as the worms are discovered. Young worms live in the substrate and feed on detritus - a thorough cleaning is usually necessary to prevent reinfection.